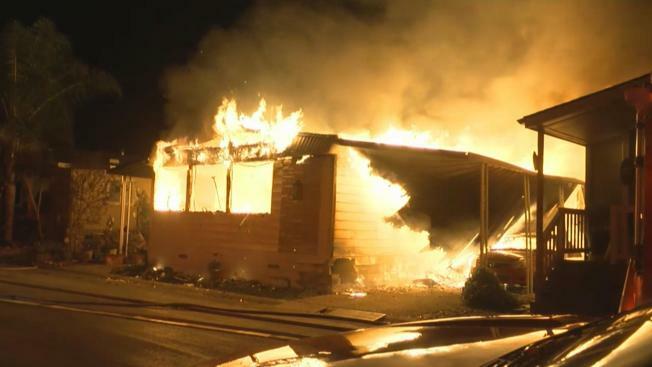 Firefighters are investigating the cause of a gas-fueled fire that ripped through a south San Jose mobile home late Thursday. The blaze sparked around 10 p.m. in the Monterey Oaks Mobile Home Park on Old Monterey and Bernal roads, according to fire officials. The five people inside the trailer where the fire broke out were able to get out safely, officials said. While battling the flames, however, the heat was so strong that San Jose Fire Department officials at one point said they were considering evacuating nearby mobile homes. Firefighters were able to bring the situation under control, but only after the mobile home was destroyed.